In November 2007, Connie Woodhouse, Jeff Lukas, and several colleagues held a workshop in Albuquerque, NM as the first stage of a NOAA-funded project to expand and improve the usability of tree-ring reconstructions for drought planning and water management in the Rio Grande basin and adjacent basins in New Mexico. Based on feedback from a workshop participant with the New Mexico Interstate Stream Commission, Woodhouse generated a reconstruction for the Canadian River near Sanchez, NM. This reconstruction, along with two reconstructions for the Rio Grande at Otowi Bridge, NM (1 - NRCS Flows, 2 - Natural Flows) were presented at a followup workshop in Albuquerque in May 2008. Because the observed flow record for the Canadian River is highly skewed towards high flows, resulting in a non-linear relationship between the observed flow record and the tree-ring chronologies, the observed record was transformed into log 10 units prior to calibration. A forward stepwise regression procedure was then used to calibrate the log-transformed observed flow record with a pool of potential predictors consisting of tree-ring chronologies from Colorado and New Mexico. Five chronologies were selected by the stepwise procedure for the reconstruction model. Validation statistics were computed using a leave-one-out (cross-validation) approach. After calibration and validation, the reconstructed flows were back-transformed from log units to the original units (acre-feet). Note: the calibration and validation statistics below were computed during the model development and reflect the relationship between the log-transformed observed flow record and the tree-ring predictor. 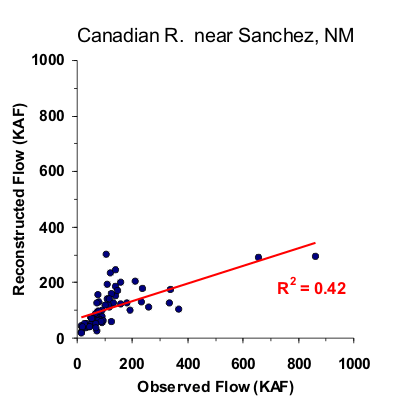 The scatterplot below in Figure 1 shows the relationship between the back-transformed observed flows and the reconstructed flows, which have a lower R2. Also, the Standard Error of the Estimate and Root Mean Square Error reported below are in log units, and the RMSE can't be used to compute confidence intervals. Figure 1. Scatter plot of observed and reconstructed Canadian River annual flow, 1937-1997. Figure 2. Observed (gray) and reconstructed (blue) Canadian annual flow, 1937-1997. The observed mean is illustrated by the dashed line. Figure 3. Reconstructed annual flow for the Canadian River (1604-1997) is shown in blue. Observed flow is shown in gray and the long-term reconstructed mean is shown by the dashed line. Figure 4. The 10-year running mean (plotted on final year) of reconstructed Canadian River flow, 1604-1997. Reconstructed values are shown in blue and observed values are shown in gray. The long-term reconstructed mean is shown by the dashed line.